“I very seriously doubt that,” he snapped back. The fourth song was a solo showcase for the trumpeter, who, I could now see, was indeed Marsalis, but who no more sounded than looked like what I expected. He played a ballad, “I Don’t Stand a Ghost of a Chance With You,” unaccompanied. Written by Victor Young, a film-score composer, for a 1930s romance, the piece can bring out the sadness in any scene, and Marsalis appeared deeply attuned to its melancholy. He performed the song in murmurs and sighs, at points nearly talking the words in notes. It was a wrenching act of creative expression. When he reached the climax, Marsalis played the final phrase, the title statement, in declarative tones, allowing each successive note to linger in the air a bit longer. “I don’t stand … a ghost … of … a … chance …” The room was silent until, at the most dramatic point, someone’s cell phone went off, blaring a rapid singsong melody in electronic bleeps. People started giggling and picking up their drinks. The moment—the whole performance—unraveled. Marsalis paused for a beat, motionless, and his eyebrows arched. I scrawled on a sheet of notepaper, MAGIC, RUINED. I tell you this story because, in many ways, it describes Mary’s life. The magic of her life was ruined when Jesus died on the cross. Her hope was Jesus. He had changed her life, and she had followed him ever since. He had cast seven demons out of her freeing her from untold torment. He had given her life…a reason to live…a place in the kingdom…He had given her worth and dignity…understanding…compassion…love…and he had given her hope. Now that hope lies at the bottom of her heart, flat, and lifeless. But something helps her survive that cruel moment. Something resilient, like a blade of grass that springs up after being stepped on. That something is love. Love brought Mary to his cross. And love brings her now to his grave. The early church looked at Mary, weary with weeping grief, just outside the tomb of Jesus, as a symbol of the whole world. Mary’s tears are the tears of Fresno where a man gunned down three random men in an apparent hate crime. Mary’s tears are the tears of Colombo, Sri Lanka when a garbage dump collapsed and crashed into nearby homes, killing dozens. Mary’s tears are the tears of the family of Robert Godwin Sr., 74, a former foundry worker and father of 10 who was picking up aluminum cans on Sunday when he was shot and then the video was posted on social media. Mary’s tears are the tears of the families of those killed by poisonous gas attacks in Syria that killed at least 86 people, including 26 children. And Mary’s tears are the tears of your life, too. Mary is a stand-in for all the grief and suffering of all the world. But here is what is important to remember: It is to Mary in the predawn dark, in her most painful moment, that Jesus appears. Of all the people that Jesus could have revealed himself to, he chooses Mary first. Peter and John had been there earlier in the morning, but they didn’t see angels. Angels only turn up for Mary and her tears. Maybe it’s because, sometimes, you can only see angels through tears. Easter is not about escaping this sorry dark world into the next world. Easter is about tearing a hole in the fabric that separates this world from the next so that heaven can get into this world. When stars were still just the holes to heaven. I love that imagery. Next time you step outside and look up to see the stars, think of them as tiny holes in the floor of heaven. Easter is a Grand Canyon size hole in the floor of heaven. The eternal came flooding into our world through that opening when the stone was rolled away. 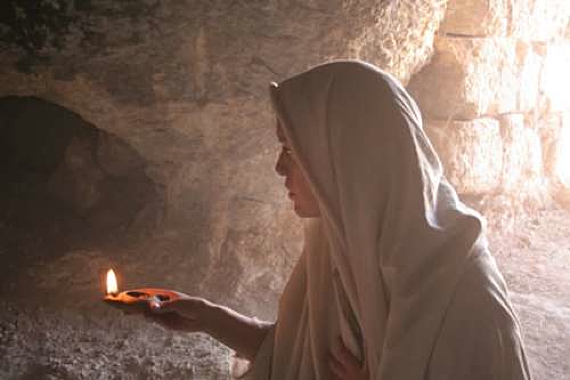 The bodily resurrection of Jesus is a foretaste of the renewal, re-integration and restoration that is coming when the ‘thy-will-be-done-on-earth-as-it-is-in-heaven’ part of our Lord’s prayer is answered once and for all. Here’s the point of Easter: God loves this world. Sometimes I’ve said to skeptics that don’t yet believe in our faith that they should at least hope our faith is true; because it makes so much sense of the longings that are latent in all of our souls. We all long for [Eden], and we are constantly glimpsing it: our whole nature…is still soaked with the sense of ‘exile’. You, your children, and grandchildren may have walked away from the Church, but deep down they long for what the church stands for to be true. They have an ache for Eden. The thirst for spirituality is not an illusion. It is there because we were made for another reality—God. Because God is our home. Your deep passion for health and education for children, justice in the world, and beauty in your life—these things are not random desires, they are inside us because they are a part of a world created by a God who made it to operate that way. Why did my oldest son, Cole, take his four children to a park in Tacoma yesterday to pick up trash and celebrate Earth Day? Because he is a new age, liberal, tree-hugger? No, because for my son, who loves Jesus as passionately as any man I know, believes that how we respect this earth is a reflection of our love for the Creator-God who created the first garden called paradise and came back to life in a second garden of tombs. The cell-phone offender scooted into the hall as the chatter in the room grew louder. Still frozen at the microphone, Marsalis replayed the silly cell-phone melody note for note. Then he repeated it, and began improvising variations on the tune. The audience slowly came back to him. In a few minutes he resolved the improvisation—which had changed keys once or twice and throttled down to a ballad tempo—and ended up exactly where he had left off: “I…don’t…stand…a…ghost…of…a…chance…with … you …” The ovation was tremendous. That is a small picture of what God has done for us and the world at the empty tomb of Jesus. All the ways that we are unraveled, all the ways that we and the world are ruined—Jesus used all of that and transformed it into a restoration and healing. Jesus has taken our brokenness, tears, and ruin—and he has refashioned it into a redemption song. This entry was posted in Uncategorized and tagged Christian maturity, healing, Jesus, lament, Weeping. Bookmark the permalink. This is my favorite so far Joe. Whenever you get that book done, this belongs in there somewhere. Beautiful imagery and excellent thoughts on which to meditate. Thank you. Thanks Joe. I’m going out now to praise my Lord’s stars! I learn something every time I read your stories.